Whether you are learning to bake in India or already a professional wanting to start your own baking business, having the right equipment will make or break your cakes and cookies. It can be the difference between a perfectly fluffy cake or flat cake, a small-scale business or one with unlimited potential. So if you are confused about what equipment you should be buying to kick-start your dream venture, here are a few baking essentials and that are the life bread of any baker. For any professional baker with the intention of running a home baking business or a full-time bakery, a stand mixer is indispensable. 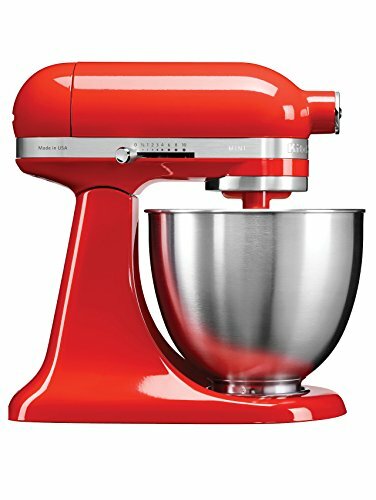 The KitchenAid Artisan Mini 5KSM3311XBHT has a 3.3-liter capacity which ideal for preparing about 5 dozen cookies and enough batter for 5-6 cakes. Since it is a tilt-head design, adding ingredients is quite easy. It also features a soft start to prevent splatter while you can amp it up later thanks to the 10-speed settings. You can also buy attachments such as the Spiralizer, food processor, pasta maker, ice cream make which make it more than just a piece of baking equipment. 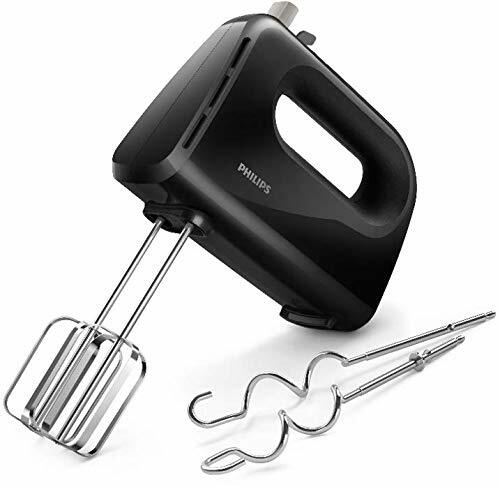 If you are hobbyist baker and need a mixer on a low budget for making cookie dough, cake batter or whipping up cream in smaller quantities, a hand mixer is ideal. The Philips HR3705/10 hand mixer offers 5-speeds plus a turbo mode for when you need things mixed and whipped on the double. With it, you get stainless steel beater and kneading hooks which are easy to clean and rust –free so they last you for years to come. Even for business purposes, a hand mixer can be useful when you need to mix a smaller batch of ingredients or cakes and cookies. In baking, everything comes down to precision. Whether it is flour, baking soda, butter or other ingredients, even the slightest of mistakes means you can end up with a raw, dry or a flat cake. 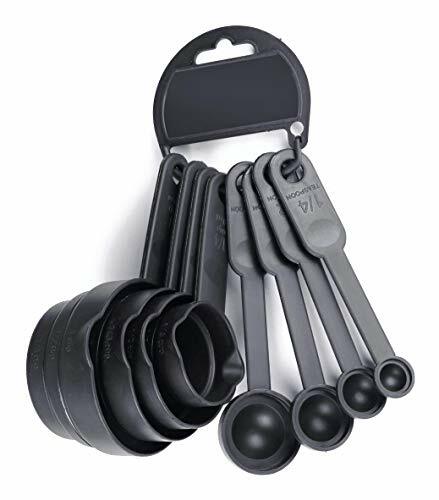 This is why we recommend you this 8pc measuring cup and spoon set which includes from the smallest to the largest spoons for pin-point accurate measurements. All of the measuring spoons and cup are made you premium food-grade plastic which makes them 100% toxic free. Plus, since they are dishwasher safe cleaning them after a long hectic bake is very easy. 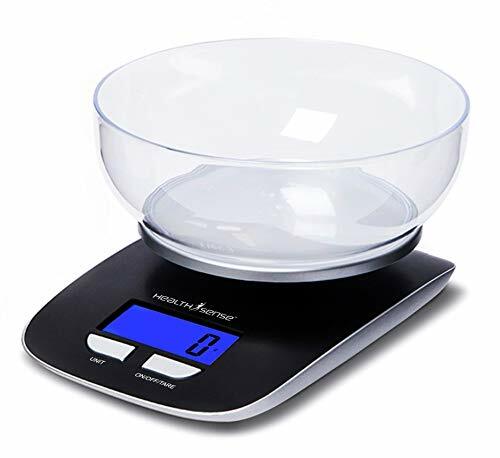 Apart from measuring spoons and cups another important tool that helps get accurate measurements when baking or cooking is a food scale. And the HealthSense Chef-Mate KS 33 is one of the most advanced and accurate digital kitchen scales in the market. Here’ why. The reason it is so accurate is the G-Force load sensors which are designed keeping mind the important accuracy in cooking. It also lets you measure in multiple units such grams, milliliters, pounds or ounces which unit conversion button that takes mere seconds. And when not in use, turns off automatically to save battery. While it lacks a little in durability, what makes these Kurtzy tins a great buy is their versatility. 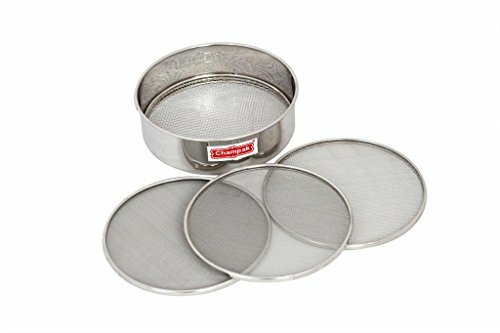 You get tins from as small as 18cm in diameter to an Extra Large 28cm tin so you can easily make a 6-tier or smaller cake with this set (the power is completely in your hands). And no the cake won’t stick to the bottom either as the tins are all non-stick so you do not have waste a lot of butter or oil greasing the tins. This also makes hand washing them very easy as they do not need to scrubbed or you can even throw them into the dishwasher. 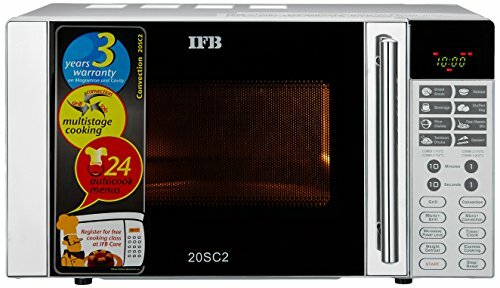 This 20L microwave oven has ample room to bake 2-3 or more cakes at a time so you complete smaller order or bake or a small gathering in a jiffy. And when you are baking, you can also enjoy grilled food, make rice, etc. thanks to its 24 auto cooking options. It also features a defrost setting which lets you defrost and meats and veggies in minutes. And don’t worry about leaving the food in the oven as the Keep warm function maintain temperature for about 90-minutes. It also has a child lock feature so no one can accidentally mess up your baking or cooking while adjusting temperature, timer, etc. is quite simple with the touch controls. Once the cake is out of the oven it needs to be cooled down before you can cream it so it does not fall apart and for that, a good durable cooling rack is a must. Well, that is just what this cooling rack by Syga is. The wired rack is large enough for 1 large or 2 smaller cakes or 15-16 cookies or those fancy French bread. In case you have multiple orders at once, you can also go for multi-level racks which allow you to cool cakes, cookies, bread, etc. all at once. 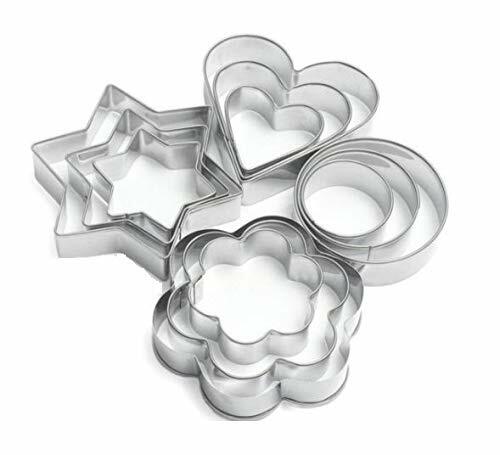 This set of 12 cutters from Syga comes with 4 designs namely, flower, star, heart and round with 3 sizes of each shape. The cutters are also made of non-stick stainless steel material so any dough on the cutter can be easily removed rather than getting wasted. 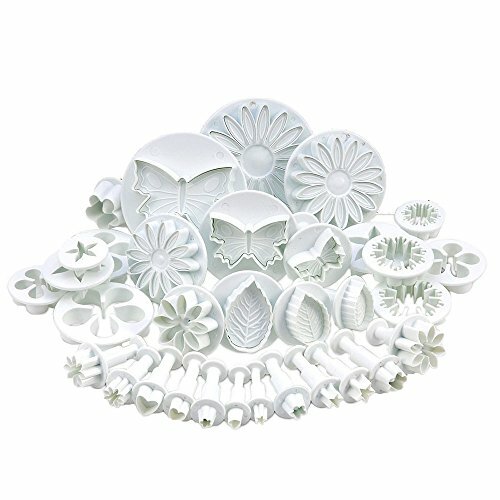 Just like cookie cutters, you also get fondant cutters which help carve out those intricate fondant designs of flowers, butterflies, leaves, etc. This set by Syga includes 33 cutters of different shapes and sizes. Since these are plunger cutters, all you need to do is roll out the fondant, place and press the plunger and voila, you will have a detailed design sure to leave people in awe of your cake. Also, the set is made of durable food-grade plastic which makes it safe to use for years to come and easy to clean. It is always handy to have an extra glass or plastic mixing bowl as it will help you prep multiple ingredients like your cream (with multiple colors), truffle, etc. at one go. This glass bowl set by Signoraware includes 3 bowls of different sizes. These bowls can resist heat to up to 400-degrees Celsius and are BPA free which means it is 100% toxic free. When not baking, the bowls can also be used to reheat food and put away into the dishwasher for easy cleaning. In case you prefer plastic bowls over glass bowls, this set of 4 bowls by All Time is just perfect for any kitchen. IDEAL FOR ICING: The Kurtzy Cake Decorating Turntable provides an elevated position ideal for icing and applying finishing touches to your cakes, pies, flans and biscuits. 360 DEGREE: The rotating turntable allows you freely turn your pastry with ease, allowing for easy piping, smoothing and decorative touches. Diameter of the rotating stand is 30cm, height 13.5cm. MATERIAL: The Cake table is made up of Fibre glass material with Strong Aluminium base. 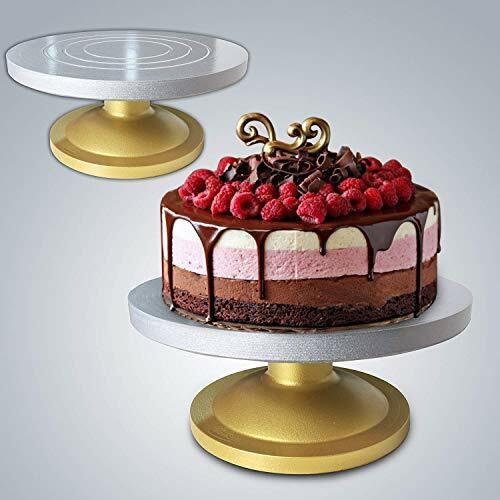 If you are looking for professional turntable stand for giving your cakes, pies, and muffins smooth and flawless icing, the Kurtzy icing table is hands down the best. That is because it provides stability like none other thanks to its sturdy aluminum base, fiberglass top and anti-slip base at the bottom. The rotation is very smooth and there is ample room to hold a cake of 3-4kgs without toppling over when spinning. So do not hold yourself back. Let your creative juices flow and leave people gobsmacked with your finishing. DURABLE FDA food grade silicon brush, safe as turkey baster brush and kitchen baster by professional and home cooks. FLEXIBLE bristles handles heat to 480 degF, glides easily on food, does not shed bits in food, or clump together to retain smells. 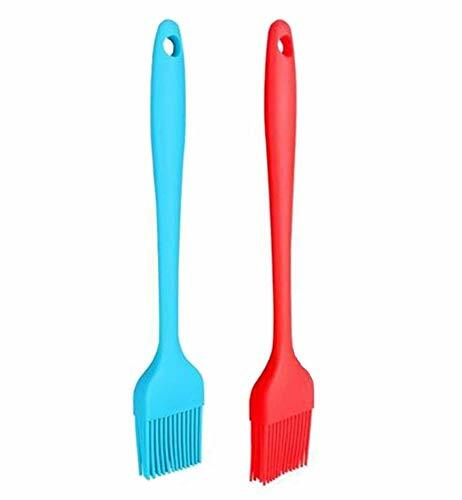 VERSATILE silicone brushes, Two 8.1-inch long x 1.3-inch wide , are great basters for bbq, barbecue, baking, cooking, food decorating or kids craft. A pastry brush is more useful than you would think. Why? Because it can be used for a number of things like glazing the puff pastries with egg wash, milk or even butter (so they come out golden brown) or simply to dust off any excess icing sugar on the muffins, doughnuts, etc. These silicone brushes by Syga are FDA approved and thus 100% safe for use while baking and cooking even at a heat of about 480-degrees Celsius. The silicone build means you can even dump them into the top drawer of your dishwasher for hassle-free washing. If you are using fondant it is almost impossible to have fondant of all colors but there is a simple solution to it, food colors. Yup, just stock up on white fondant and use these 100% safe food colors to get the color of your choice. The pack includes 20ml of Orange, Yellow, Keshar, Tomato Red, Raspberry Red, Blue, Green, Chocolate Brown, Kalakhatta & Pink (pretty much every color you will ever need). The liquid colors mix up pretty well within seconds and do not impact taste either. Sifting icing sugar with flour or just flour are important steps in baking which you can only get right if you have a fine sieve. Thankfully, that is precisely what you get with the Champak Stainless Steel Sieve. It comes with multiple sieves each finer than the other which also make the sieve perfect for sifting atta, wheat, rice, etc. 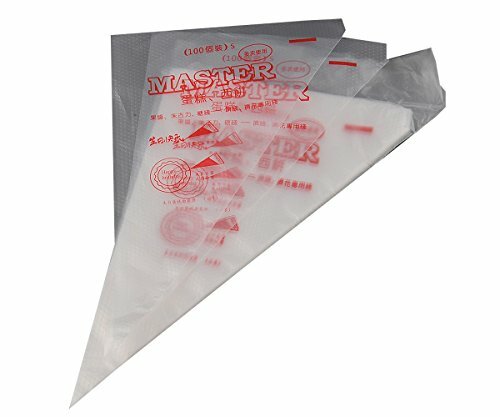 If you are looking for something on the cheap, these plastic icing bags by Happy Chef are ideal. You get about 100 icing bags for less than Rs. 200. But keep in mind that these piping bags cannot be washed and reused. So if that is what you were going for then this 32pc set by KaCool is perfect for you. Not only does it include reusable plastic piping bags but also comes with 3 scrapers and a set of nozzles each of which is dishwasher-safe. Like measurements, temperature also plays an important role in baking. Now, keep in mind, the temperature on the inside of the oven is never as you set it. Why? Because every time you open the oven for checking on the cake and cookies, you let out some of the heat. This is why for accurate temperature reading we recommend bakers to use an oven thermometer like the Generic OVTH Thermometer. Not only will the thermometer display accurate readings of the inside temperature but its stainless steel build also gives excellent durability as it can withstand a high amount of heat. It is also pretty compact and thus easy to put anywhere into the oven without sacrificing on a lot of space. No stick, how? - The secret is in the uniquely engineered silicone we use to coat the entire rolling pin with, making it extremely durable and non-stick nothing beats it. 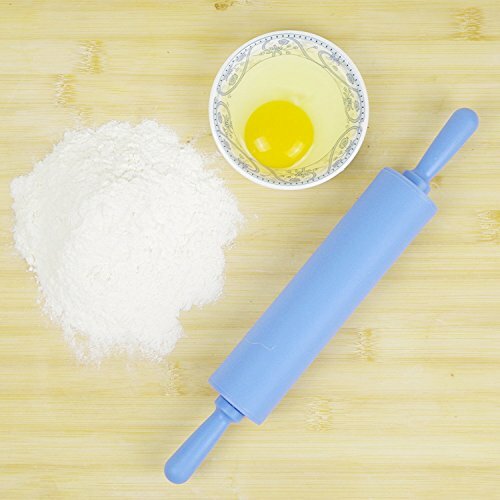 So Easy to Use - The best rolling pin I have ever used - People are going crazy about how easy to use and great this product is, supplies will not last long. To roll out the fondant or dough you will need a rolling pin that covers every inch of the dough. You also have the option of going for a rolling pin with handles at the end or a one-piece pin. If you are a professional and have to roll out fondant and dough on a regular basis you will find a pin with handles comfortable to use. And the reason we recommend silicone rolling pins like this one is because they do not let the dough stick to it which makes them easier to clean and reduces wastage. If you are new to baking, this one-piece rolling pin with a special silicone mat should help you get the job done without creating a mess. 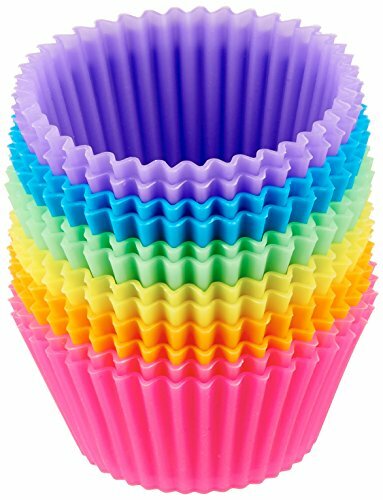 If you make a lot of muffins and cupcakes, this silicone muffin baking set is a blessing in disguise because unlike most sets this one can be reused. Yup, the set saves the cost of having to purchase additional disposable muffin sets and can be dumped into the dishwasher for an easy and quick clean. Taking out the cupcakes and muffins after baking is also hassle-free and does not require any kind of greasing either. The pack comes with 12 cups each of which can withstand temperatures as high as 500-degrees F and is odor and stain resistant giving you fresh, hearty muffins in each use. A spatula, believe it or not, is like a best friend to any baker looking to run a profitable business. Why? That is because silicone spatulas like the one mentioned above by Ramkuwar help remove cake mixture and melted chocolate inside bowls to the last drop so your waste is minimal. This set has 3 spatulas of different sizes all of which are BPA-free and approved by the FDA so they are 100% safe for daily usage. They can withstand 600-degrees F of heat and come with reinforced stainless steel handles so it can easily handle the day to day rigor, unlike plastic spatulas. Just like you have tins of cakes there are also tins available for bread and the one thing that is special about this bread tin by SYGA it is its carbon steel build. That is because it not only provides you with excellent durability but also heats up evenly so the bread is cooked evenly inside out. 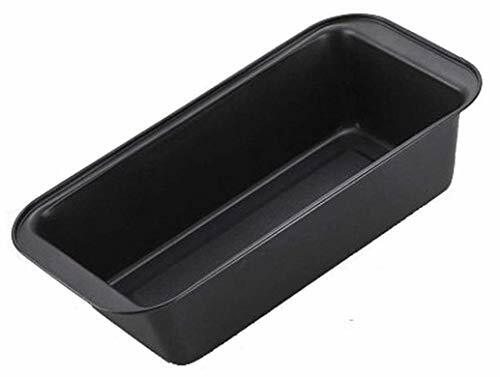 Plus, since it has a non-stick coating it requires little to no butter or oil coating and bread easily comes out without any of it sticking to the bottom. This in tandem with the smoothened edges also make the tum easy to clean and hold. For the quality you get at less than Rs. 250, this bread tin is a bargain. Cielo_Stainless Steel Egg Wick Set,Pack of 2 pc. safe to be washed in your dishwasher. In case you do not have a mixer yet or live in an area with a lot of power cuts, a manual whisker makes for a good backup plan. 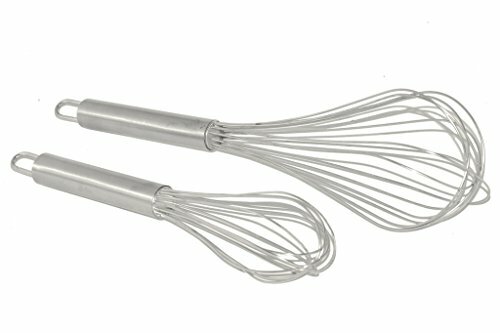 This Cielo whisk is made out of stainless steel which means you get a whisk that is both durable and easy to clean as it is also dishwasher-safe. There are 2 whisks, one for larger mixes while the other is ideal for smaller mixes. The hook at the end of the whisk means when not in use, you can simply hang them around the countertop for quick access. If you find your bread and cakes still sticking to the bottom of the tin a parchment paper is a cheaper alternative to greasing with butter or oil. And since the tin has no greasing or bread/cake sticking to the bottom, cleaning them takes mere minutes. 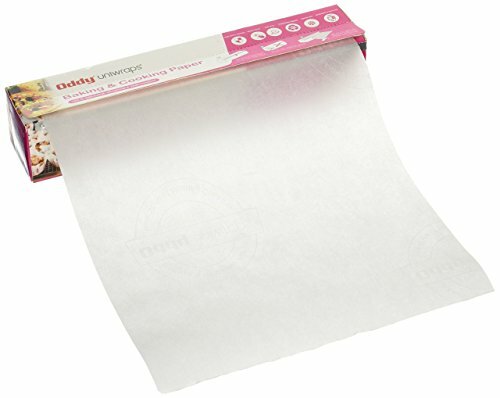 The baking parchment by Oddy is heat-resistant up to 220-degree Celsius thus perfect for both baking or even reheating food in the microwave as it prevents food from drying out. Similarly, it can also be used to store food in the freezer. 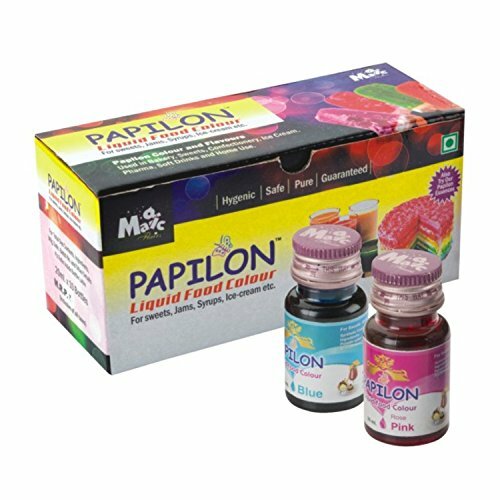 It has dimensions of 260mm x 20m and is made of food-grade material and does not come with any harmful chemicals. 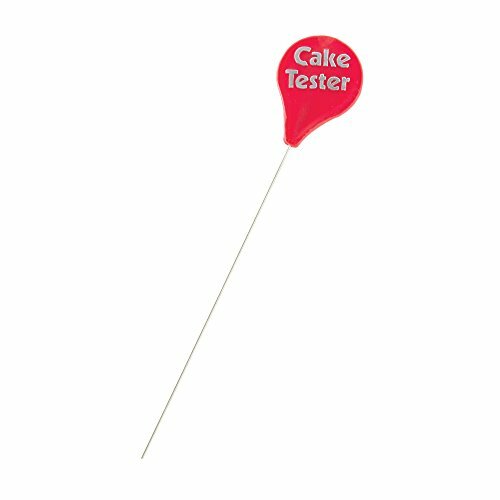 In case you didn’t already know, skewers or toothpicks are one of the easiest ways to know if the cake or bread are perfectly baked or not. Just poke it in and if you see no batter stuck to it, voila, your cake is ready to go on the cooling rack. Personally, I prefer skewers over toothpicks because they are longer and thus reducing the chances of you ending up with burns. It also saves you the cost of having to purchase them constantly unlike toothpicks which come in packs of 90 or less and cannot be reused. 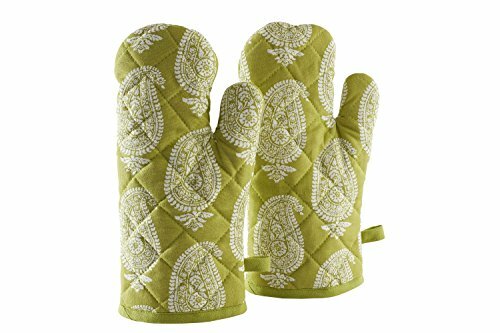 In order to take out those hot pans and trays out of the oven without burning your fingers, you will need a pair of oven gloves. The oven gloves with Solimo have been designed keeping in mind user comfort and safety. This is why these come with 3.5 layer of pure cotton which provides good insulation and softness so holding the trays and tins is easy. And when they dirty with constant use, you can put them into the washing machine for a quick and easy wash.
Last, but not the least comes one of the most important tools for those that love working with fondant, a fondant smoother. 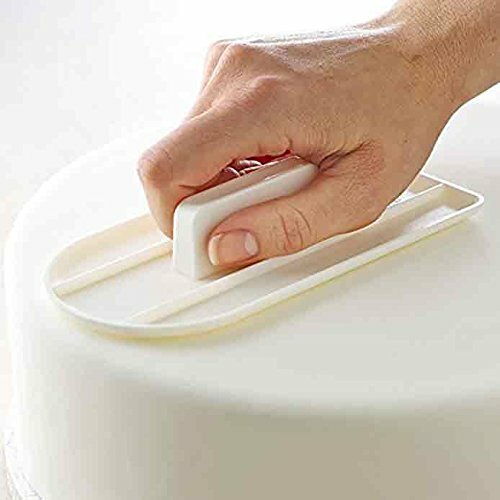 The House of Quirk Cake Smoother will give your cakes whether cream or fondant a smooth premium finish (because nobody likes a fondant cake dented all over). It is made from durable plastic and while it will need a little practice at first, once you get the hang of it, it is going to be one of the most used tools in your arsenal.